Dr. Davis is a native of Limestone County, Alabama. He was a student in the Athens City School system and graduated from Athens High School in 1992. He accepted a golf scholarship to attend Martin Methodist College in Pulaski, Tennessee. 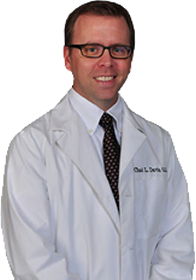 In 1997 Dr. Davis received the Bachelor of Science degree in biology and a minor in chemistry from the University of Alabama in Huntsville. His study then led to Philadelphia, Pennsylvania where he attended the Pennsylvania College of Optometry. Pediatric, Low Vision, Ocular Disease, and Hospital rotations were performed in Camden, New Jersey, Roanoke, Virginia, and Columbus, Georgia. The Doctor of Optometry degree was awarded to Dr. Davis in May of 2001 from the Pennsylvania College of Optometry. Dr. Davis then returned to Athens and opened Davis Eye Care in October 2001. Dr. Davis is a member of the International Academy of Sports Vision and has a great interest in working with athletes of all sports. He is also a member of the Alabama Optometric Association, the American Optometric Association, the AOA Contact Lens and Cornea section, and the AOA Sports Vision Section.